I learned about a new kind of renewable energy this week when I attended the E3 Conference (Energy, Economy and Environment) hosted by the University of Minnesota's Initiative for Renewable Energy and the Environment (IREE). It was a great day of speakers and conversation and - contrary to other conferences I've attended - there was a solid mix of business leaders, clean energy advocates and policymakers there. The new energy I learned about is called osmotic energy. Here's the scenario: When a river runs into an ocean, freshwater mixes with saltwater. A large amount of energy is released when these two types of waters with different salinity meet. 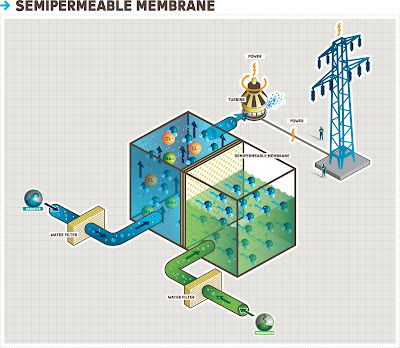 To capture this energy, a semi-permeable membrane can be placed between a reservoir holding the freshwater and another holding the saltwater. A net flow of water towards the saltwater side will occur and this pressure can turn a turbine to create clean energy. Cities are often located where rivers run into the ocean, so the hope is that this technology could be located near the areas that consume the most power. What's more, this could be used as "baseload" energy - steady and very reliable. Osmotic energy has been proven in the laboratory and is now being developed for commercial use by companies in the Netherlands and Norway. The speaker at the E3 conference, Terje Gjengeda, is a Norwegian professor and vice president of Statkraft, a company that will begin commercial testing in April 2009. The technical potential of this energy in Norway is up to 12 terrawatt hours per year, or enough energy to power about 540,000 households for a year. Very interesting. Can I have more info on this innvative technology. Ravi - I would suggest contacting Statkraft or another company directly for more information on this technology. There are also lots of website with more info.